Create a one-of-a-kind sparkly crystal ornament for yourself or a gift: The trick? 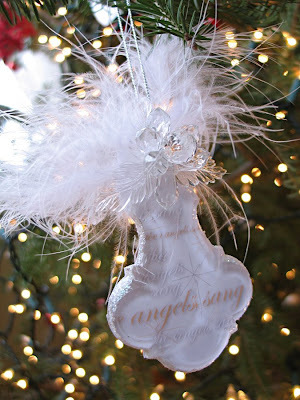 Use a plain store-bought glass ornament and embellish it with some inspiring words! I found these dainties a couple years ago ... off-season and deeply discounted. Look for any-shape, crystal piece that has a flat back - in order for you to affix your art to the back. Don't worry if you can't find one with the feather accent already on - you can glitz the plain ones up pretty easily. I designed my own art, but you can use your scrapbook papers, a special photo, or a favorite Christmas card. Trim and glue it to the back of the crystal. For a finished look, after the glue has dried, paint the back in a coordinating paint. Then seal with a varnish. Scoop up a bunch of these right after Christmas to make teacher or hostess gifts for next year! As always, beautiful!! Have a blessed Christmas! !